10" H x 30" Dia. 12" H x 38" Dia. 12" H x 48" Dia. 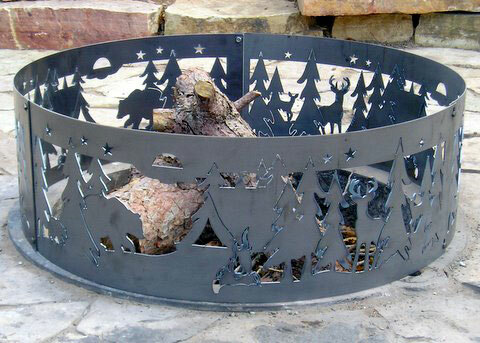 To add a rustic yet elegant touch to your next cook out, campfire or bonfire you might try a decorative fire ring. This ring features a wildlife design that will create fun atmosphere. It will also protect your guests from sparks and flare ups. The ring is made form 12 gauge steel. The finish oxidizes naturally for a rustic look. It is easy to set up and place around your outdoor fire pit. It is available in various sizes. Will this stand up to the weather well? It is made from 12 gauge steel and not stainless. Having lived in NW MT I would say if left outside all year, it would need to be replaced in 3-6 years. They do have some stainless steel rings for gas units that may hold up better. Could I make this fire pit into a propane fire pit? You could indeed use this ring on the outer portion of a propane fire pit. Can a cooking grate be added to this ring? While the manufacturer does not offer such an accessory, there is no reason why a cooking grate could not be used. The ring is substantial enough to support the added weight. This product was delivered very quickly. It?s a really nice product, and has met and exceeded our expectations easily! I would definitely recommend this product!